Cornish are stocky meat birds from the Southwest corner of England with short, close-fitting feathers. Because they don't have much insulation, they don't do especially well in drafty cold, even though their small pea combs are not usually subject to frostbite. 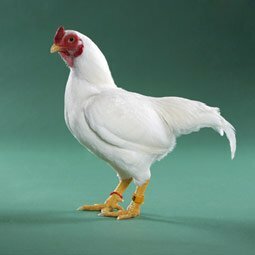 Most chicken meat bought in US supermarkets comes from a White Cornish x White Plymouth Rock cross. Because the poor crosses were bred to be confined, they're not the best pets, and the crosses suffer from a variety of skeletal and heart problems due to their fast growth, poor things! (For healthier meat birds we would recommend looking for the new hybrid usually referred to as the "Colored Ranger") The regular Cornish don't suffer from the same health problems the Cornish Crosses do. Nonetheless, Cornish are still not especially good foragers, nor are they usually very active birds in general. We're told they can make great lap chickens and have a gentle nature, even though they are large, heavy and look fierce. They tend to be on the lower end of the pecking order in mixed flocks despite their size.